Just because the snow has hit the ground doesn't mean its time for your RV to go into hibernation! Embrace the Canadian winters and enjoy an RV vacation. There are plenty of wonderful things to explore during the Canadian winter. Enjoy ice skating on the world's largest skate ring at the Rideau Canal, visit the wonder and beauty of the Niagara Falls, or enjoy the winter festivities in the city of Quebec. November 3rd through January 31st starts the holiday season for Niagara Falls! Visit the CAA Winter Festival of Lights, enjoy the beauty of the 6 km route of lights, ice skating, concerts, fireworks and more. Camp along the Niagara river and visit the legendary and beautiful Niagara Falls. 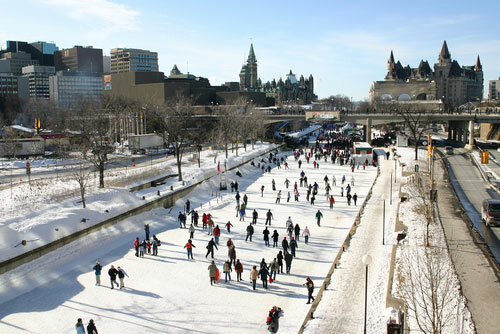 When winter overtakes Ottawa, Ontario, the Rideau Canal freezes creating the world's largest skate rink. The skate way is 7.8km long. Enjoy skating during Ottawa's winter festival the Winterlude which occurs during the first three weeks of February. There are several campgrounds in the Ottawa area that RV friendly and are the perfect home-base for these family-friendly and fun activities. Quebec has plenty to offer a family on vacation in the heart of winter. The Quebec Winter Carnival goes from February 1st to the 17th. This festival includes activities like parades, a masquerade ball, or visit the Ice Hotel. The hotel is open for four months starting in, January and ending in April. The hotel is made out of 15,000 tons of snow and 500,000 tons of ice and is an amazing sight to behold indeed. RVing doesn't have to stop because the temperature drops and the snow begins to fall. 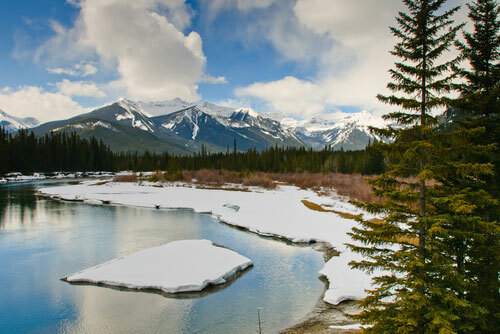 There are RV campgrounds all over Canada, with wonderful winter activities to explore. Skiing, snowboarding, ice skating, winter carnivals, and more. If Canada doesn't stop for winter why should your camping experiences? Enjoy!